it conforms to ITU-T technology standards and the national technology system light synchronous transmission network. It can test network error code, jitter, pointer, bolt, insertion/drop, and other parameters of SDH/PDH. The test set is versatile. It can be widely used in the fields of development, production of SDH/PDH equipment and installation, authentication, operation and maintenance of telecommunication network. 2. N et charge mapping: 2Mb/s to VC-12; 34Mb/s toVC-3; 139Mb/s to VC-4. 3. Net charge test diagram: PRBS: 2 9 -1, 2 11 -1, 2 15 -1, 2 20 -1, 2 23 -1. Word: 1010, 1000, 16 Bit programmable, all 0, all 1. Parameters: error rate, error count, alarm second. Analysis of error features: ITU-TG.826. Open and cancel bit error measurement: Transmit 2 9 -1 diagram in the selected open and cancel tunnel. 7. Sweep measurement: SDH branch error sweep and branch warning sweep. 8. PDH insertion/retraction: insert PDH2/34/139Mb/ signal into STM-1/4 or retract PDH signal from STM-1/4 line signal. Jitter measuring range of the receiving part: 1.6UI, 16UI. 10. Pointer settings: burst pointer, new pointer, G.783 series, Clock Offset. 11. Pointer test: pointer value, number of positive/negative adjustment, adjustment second, NDF second, NDF loss second and VC deviation. 12. Open and cancel setting and monitoring: segment open and cancel: all settable except B 1 and the pointer. Be able to monitor all the open and cancel. Higher stage channel open and cancel: all settable except B 3 . Be able to monitor all the higher stage open and cancel. 13. The setting and acquisition of open and cancel series: settable segment open and cancel: A 1 , A 2 , J 0 , E 1 , F 1 , D 1～D 3 , K 1 K 2 , D 4～D 12 , S 1 , Z 1 , Z 2 , M 1 , E 1 , group data, maximum length for each group is 4000. 14. Additional measurement: optical power, frequency. 15. Passing method: the same with regenerator. 16. Input light interface: STM-1/4, 1550/1310nm, -8dBm(max), -26dBm(min). 17. 1 output light interface 1: STM-1/4, 1310nm, -ldBm±2.0dBm. Monitor state: -26dB. Terminal state sensitivity: -12dB. 20. Rate: 2.048, 8.448, 34.368, 139.264Mb/s±7ppm. 21. Clock Offset: ±100ppm , step distance lppm. 22. Code type: AMI, HDB3, CMI, comply with ITU-TG.703; Testing diagram: same with SDH. 23. Frame format: finished frame, unfinished frame, 2Mb/s structuralized (NX64kb/s). 24. Error insertion and measurement: support insertion of bit error, frame error, coding error, CRC4 error and CRC4 distant end error. Insertion amount: 10-3～10-7, single. Be able to carry out measurement of the five errors above. 25. Error production and measurement: signal loss, synchronous diagram loss, frame loss, multi-frame loss, error, power failure, distant end warning, distant end multi-frame alarm and AIS. 26. Analysis of the error features: ITU-TG.821, ITU-TG.826, M.2100, M.2110, M.2120. 27. Jitter production and measurement: refer to the Jitter measurement of SDH. 28. 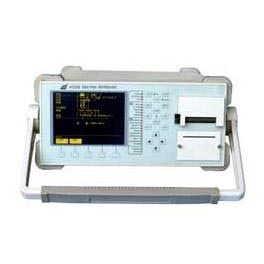 Frequency measurement: display in Hz, frequency deviation display in Hz and ppm. 29. Display: LCD, Chinese interface. 30. Print: internal heat-sensitive printer, with external paralleled print interface. 31.Dimensions(mm): D*W*H=460*380*190mm; Weight: Approx. 13.5kg . 32. Card structure: multi selection options for configuration: PDH shooting and receiving cards, STM-1 card, STM-4 card, and PDH/SDH Jitter card.